Then I flipped the paper over, taped it to the heel, matching the centerlines, and used it to mark the centerpoints of the two holes. 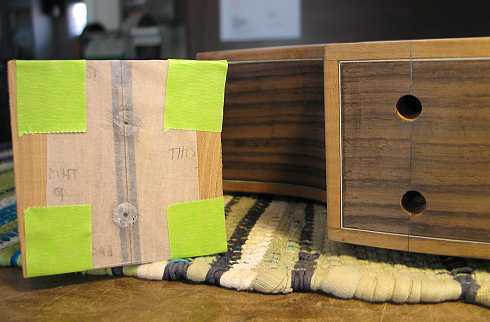 These are where I would install the threaded inserts in the heel. 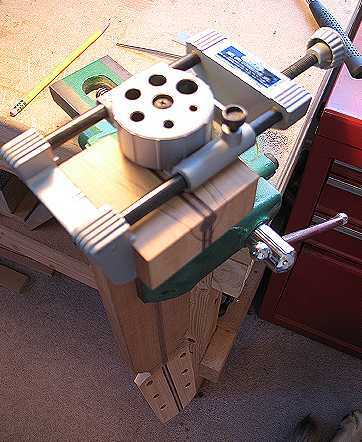 I love this dowel jig!!! 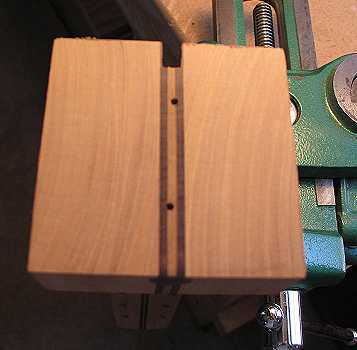 You clamp it onto your workpiece, lining up a notch that corresponds to the location of the holes in the jig, and then slide the hole-thingy so the hole you need is positioned where you need to drill the hole. 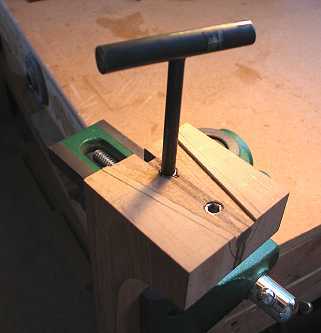 The hole-thingy ensures that you are drilling the hole perpendicular to your workpiece. 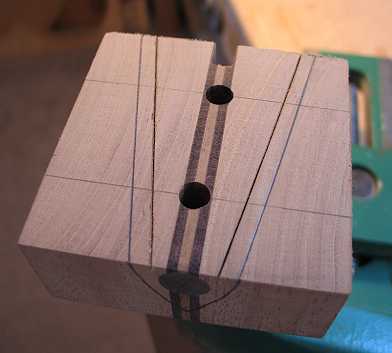 After the 5/16" holes for the inserts were drilled, I scribed two lines 3/16" inside the edges of the heel. I used my Dremel with the router base to rout out a 1/16" deep inner area. 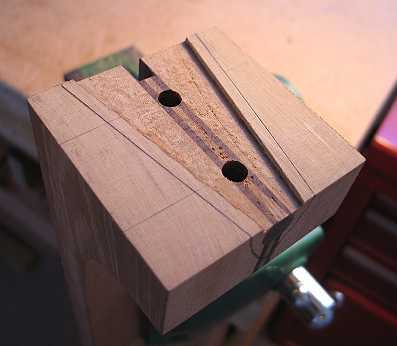 That way, the only part of the heel that will meet the soundbox will be those two 3/16" edges, making it easier to do the final fitting of the neck to the body. They are readily available at any Ace Hardware store. 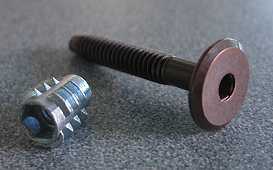 The threaded insert accepts a 1/4-20 bolt; it is 1/2" long and is inserted into a 5/16" hole. It can be inserted with either an allen wrench (I forget at the moment which size) or this T-wrench (which has 1/4-20 threads). I first used the T-wrench to install the threaded insert. Then, I used the allen wrench to carefully remove the insert, being careful not to disturb the threads in the wood. I dripped some superglue on the sides of the hole and then re-installed the inserts. The final thing I did today was to trim the neck blank to around 1/8" outside the fingerboard and heel lines already marked. 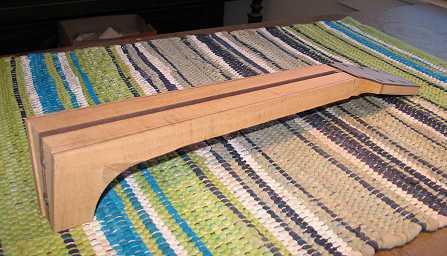 Tomorrow, I will take a little break from this neck and will start work on the fingerboard — inlaying the position and side dots, fretting the fingerboard, and trimming the end of the fingerboard. 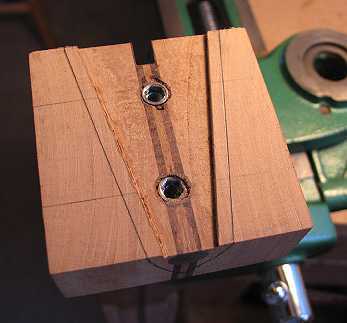 Then will come doing the inlay on the peghead and carving the neck!! !